**NOTE: In 2012, this restaurant changed its culinary concept to Asian fusion. 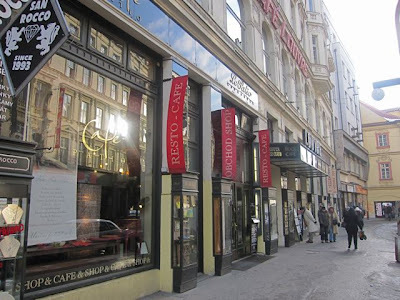 It had to be five years ago that I last ate at Resto Cafe Patio, the restaurant fronting the Le Patio furniture shop on Národní třída. Back then, the food was unimpressive, I didn't find it a good value for money, and I wrote it off. Recently, I started hearing reports from a highly respected source of very good food there. In fact, it was V telling me about some great lunches there. She suggested we go back for a meal. The place was much the same as the last time I saw it. It does have a kitschy warmth, with a lot of wood, vaulted brick ceilings, a variety of chairs, and eclectic electric light fixtures. 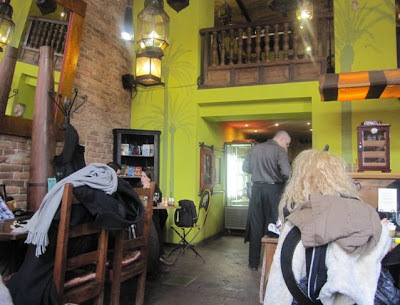 There are several different dining areas. 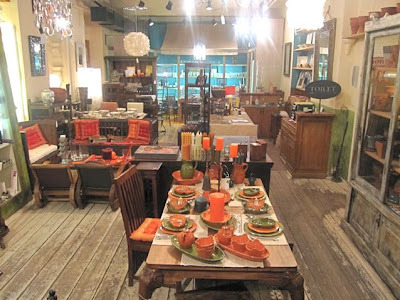 There are also two levels of Le Patio's furniture store in the basement. I liked sitting in the front of the restaurant, by the window. Busy, gritty Národní, with its clattering trams, does detract from the atmosphere a bit, though. 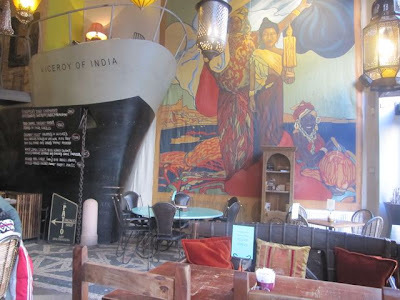 I admit that I like one of the room's dominating conceits -- the prow of a ship with a table perched on top. I never had the courage to sit there. 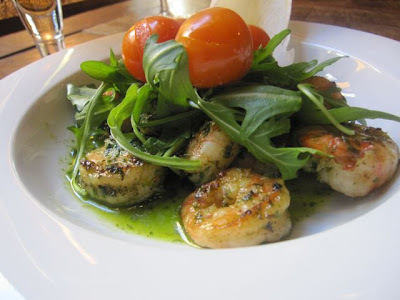 For a starter, we shared the tiger prawns (175.5 CZK). They were very fresh and cooked just right. The hot crustaceans were bathed in olive oil mixed with ginger and herbs. Rucola leaves and roasted cherry tomatoes sat on top. The prawns were on the small side, but there were 11 of them in the bowl. They did need a shot of salt. 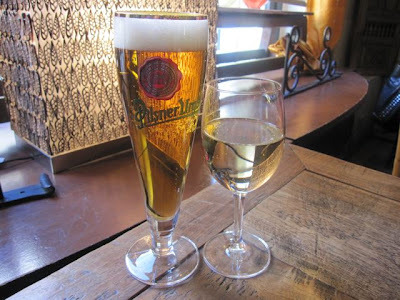 I had a Pilsner Urquell, which was only available from a .33 liter bottle. The price was a rather steep 54 CZK. V had a couple of .15 liter glasses of white wine -- Veltlínské zelené (49.5 CZK). She liked it. For a main course, I went for the Argentinean entrecote (355.5 CZK). It came with au gratin potatoes and green beans with bacon. There were streaks of a rich, salty gravy across the plate. The beef was excellent and the knife went through it easily, though it was not the most tender I've sampled in town. It was correctly, simply seasoned with salt and had light charring from the grill. The steak came as ordered, medium-rare. 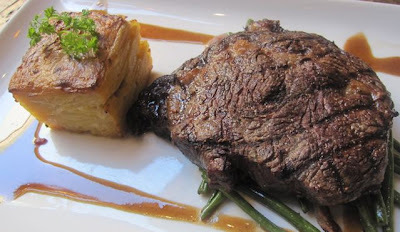 It didn't pick up as smoky a flavor as I like, so I wouldn't rank it ahead of the rib eye at El Barrio de Ángel. But I would put in my top 5 for Prague steaks. The side items deserve special mention. While this combination is not particularly creative or innovative, the attention to detail was apparent. The fresh beans were lightly cooked and still had their snap. Bacon added a smoked flavor that was decadent but welcome. The creamy potatoes looked and tasted like they had been freshly prepared just for me. They just needed salt. Their caring preparation was in sharp contrast to the tired and dried out potatoes au gratin I had at Cafe Imperial, overseen by celebrity chef, Zdeněk Pohlreich. 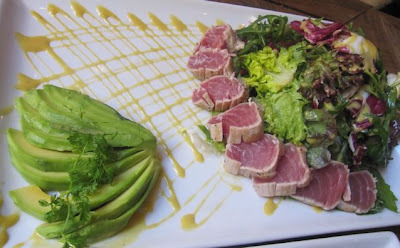 V got the dish she's gotten on almost every visit and which caused her to suggest I try to restaurant -- the seared tuna salad with avocado (216 CZK). I hereby declare this to be my favorite salad in town. First, it is a rare thing indeed that a restaurant will serve fresh tuna in a very rare state without being begged and cajoled. 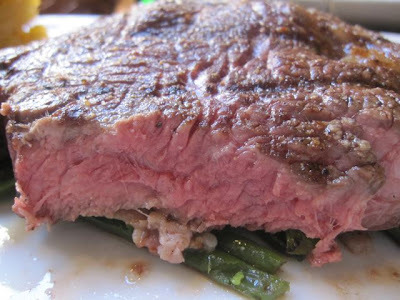 In this case, we said nothing, and yet it came out perfectly red, framed with the lightly seared edges. The clean-tasting fish picked up some flavor from sesame oil. As good as it was, V said the pieces of tuna had looked better on previous visits. The sliced avocado half that fanned out on the plate was soft and creamy. I can't tell you how many unripe avocados I've had in Prague. But this one was as they all should be. There was a variety of lettuce leaves like frisee, radicchio, and rucola, tossed in a sweet and sour honey-mustard type dressing that I liked very much. And on top of that, I really liked the price. Considering the price of fresh fish around these parts, I thought it a great bargain. 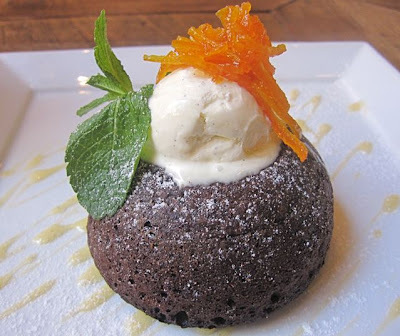 I couldn't resist ordering the chocolate fondant for dessert (108 CZK). I liked that it was a little larger than average, and the candied orange zest on top was amazing. On the downside, it was slightly overcooked, and the ice cream was not the best. During my first visit, I restrained myself from ordering the hamburger, thinking that would be too boring. But I saw one going by to another table, and it looked so good, I decided to come back the next day to try it. So I went by myself on a Sunday night. And as luck would have it, they were out of burgers. I considered leaving. 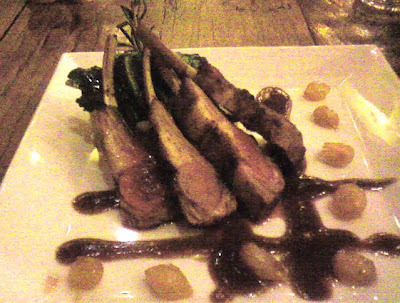 Then, I remembered they serve lamb chops, and I'm a big lamb fan, so I ordered them (365 CZK). I have to apologize for the low-quality picture from my little Nokia phone. The battery on my regular camera was dead, and I thought you should have at least some idea of how they looked. And know this: the quality of these chops was inversely proportional to the quality of the photo. Meaning they were terrific. Yes, these four babies were small, but I savored every morsel of tender meat and fat on the delicate bones. There was a rich gravy on the plate. Behind the lamb were chunky mashed garlic potatoes studded with smoked pork and topped with braised Romaine lettuce. I also enjoyed the sweet pearl onions soaked in honey, something I hadn't encountered before. 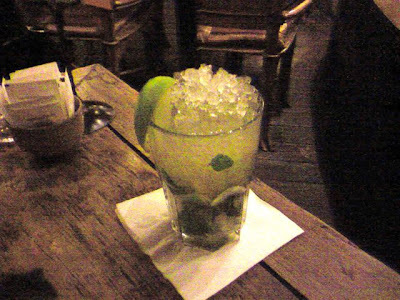 Since I was in the restaurant during happy hour (4 p.m to 7 p.m.), I ordered a mojito. It was only 85 CZK, down from the regular price of 140 CZK. A very good one. A week later I was back with V for the burger. 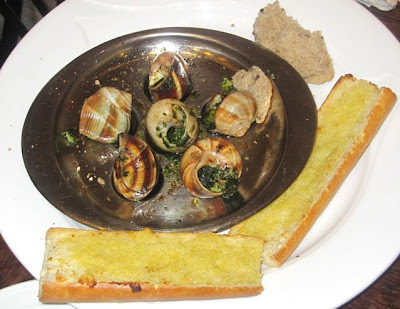 She had a starter of Escargot de Bourgogne (195 CZK). She said the snails were quite hard to get out of their shells, and that they had an earthy, garden flavor, and that they were OK. 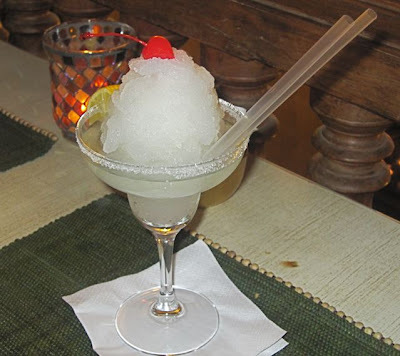 I decided to try a frozen margarita, even at the full price (140 CZK). This was a disappointment. The slushy ice was perfect, but it had a cloying, one-dimensional sweetness to it. I could taste the tequila, but barely any lime at all. V had two bottles of Mattoni mineral water, and I wasn't happy to see that they cost 55 CZK each. 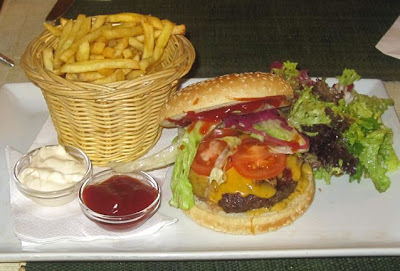 Then, I finally got my hamburger (220 CZK). It was big. The patty was both wide and thick, with a medium, pink center. It came with lettuce, tomato, red onion, ketchup and mustard pre-installed. It was an above-average burger, but does not quite crack the top 5 of Brewsta's Burgers. The fries were not so crunchy and a bit chewy, and so they were not as good as I had hoped and expected. 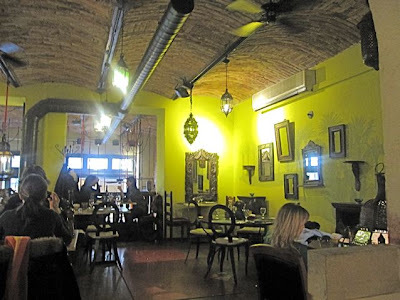 The service was generally good, but it was extra fine when we had what appeared to be the manager taking care of us. He was friendly, efficient, and looked after us well. But above all, my compliments go to the chef. The menu is not ground-breaking by any means. But you can feel the attention to detail and quality that went into most of the dishes we tried. In an uncaring city, you can tell when someone in the back cares about each dish that goes out. It's pretty unusual that I'll go to a restaurant three times for a review. But I was happy to do it because I enjoyed it every time. I used to think Resto Cafe Patio was mediocre. But I've changed my mind. During my visits, the food was almost consistently excellent. And that's the only justification for reconsideration that I need. Good Posting. Will Certainly give it a try, if in the Area. Went there last night based on your review and my wife and I really enjoyed the food. One of our top meals in prague. Thanks for the review and hope you have a great tasting 2011.